The AX Series of modular safe deposit boxes from SoCal Bridgeman combine 1/2"-solid alloy doors faced with stainless steel with cabinets of powder coated rust-resistant steel. For highest security, the doors are designed with a heavy flange which interlocks with the door jamb. 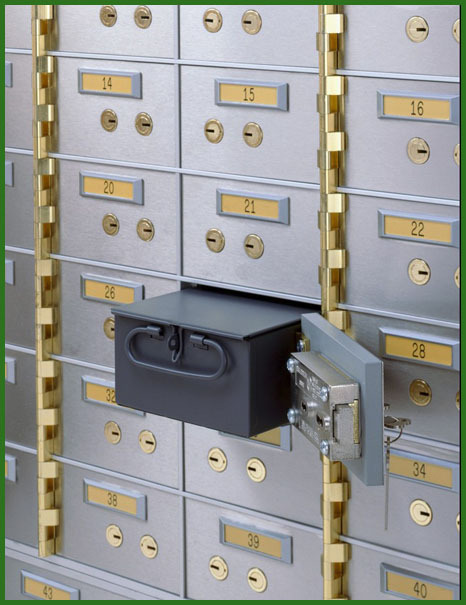 Through the use of rugged stainless steel, steel, and aluminum construction, with virtually maintenance-free finishes, The AX Series safe deposit boxes offer attractive, low-cost modular construction, and minimal upkeep. The outside dimensions of these modular cabinets are 22-1/4" H x 32-1/2" W x 24" D, and they can be stacked in sections, and bolted together through pre-drilled holes in the frame, for an easy installation. The AX series can be installed against the vault wall, utilizing every inch of valuable wall space. All boxes are equipped with U.L. listed, double key changeable locks, in a satin brash finish. Doors are fitted with a double nose, key changeable lock both guard and customer side, and listed by Underwriters' Laboratories, Locks are firmly attached to the door at four points to aid in prevention of punch attacks. The glare-resistant matte finish number plates are recessed into a special frame, which compliments the stainless steel and anodized aluminum finishes. Plates may be easily interchanged at a late date if the numbering sequence is changed. The bases, if desired are constructed of heavy-duty tubular steel and finished in stainless steel to match boxes. Standard bases are 3" high and equipped with leveling legs. Configurations: AX42 - 42 3"x5" openings, wt. 280 lbs. AX24 - 24 5"x5" openings, wt. 235 lbs. AX21 - 21 3"x10" openings, wt. 245 lbs. AX12 - 12 5"x10" openings, wt. 195 lbs. AX9 - 6 5"x10",& 3 10"x10" openings, wt. 180 lbs. AX6 - 6 10"10" openings, wt. 160 lbs. Base 3"H x 32-1/2"W x 24"D. Pull-Out Shelf - 1-1/8"H x 32-1/2"W x 24"D, wt. 30 lbs. 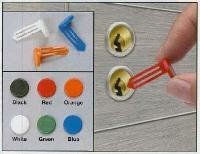 Spacer - same size, wt. 20 lbs. The AX Series of modular safe deposit boxes from SoCal Bridgeman combine 1/2"-solid alloy doors faced with stainless steel with cabinets of powder coated rust-resistant steel. For highest security, the doors are designed with a heavy flange which interlocks with the door jamb. Through the use of rugged stainless steel, steel, and aluminum construction, with virtually maintenance-free finishes, Choice of six configurations.